Finding baby girl toys for toddlers can be incredibly daunting and difficult since there are so many different options available. If you’re feeling stuck on which kind of toy you think would be best for your little girl, you’ll be glad to hear that you’re in the right place. When you’re searching for toys for toddler girls, you want to think about how beneficial and exciting they are to play with. Discovering this balance can be tough when you’re not clear on what to look for. That’s why we have researched the best toys for toddler girls and reviewed them. All you need to do is read through the choice below and select the one that you think is best for your child. A buyers guide section is also available at the end that provides you with even more details to help you feel confident about making a final decision! 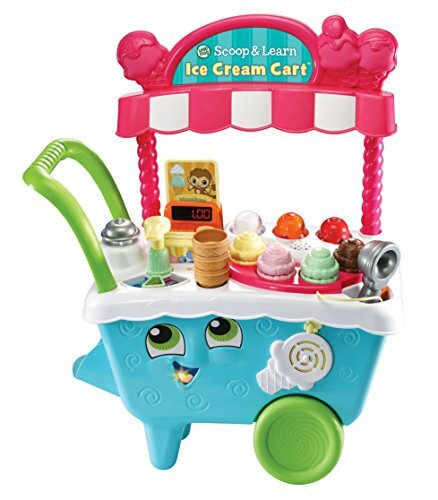 Girls have been loving this Ice Cream Cart toy due to how it has been designed with a bunch of bright colors. They’re also able to use the scoop to pretend to pick different ice creams and toppings. As a result, your little girl’s ability to play with more creativity is improved. They are also able to develop their color recognition skills because there are various ice cream colors available. In addition to this, they’ve included 6 animal cards. Kids have fun using these to familiarize themselves with animals. Girls can also push the cart around, which is awesome for their motor skills and hand-eye coordination. This is an awesome toy that allows kids to play with more creativity, while improving their color recognition abilities. 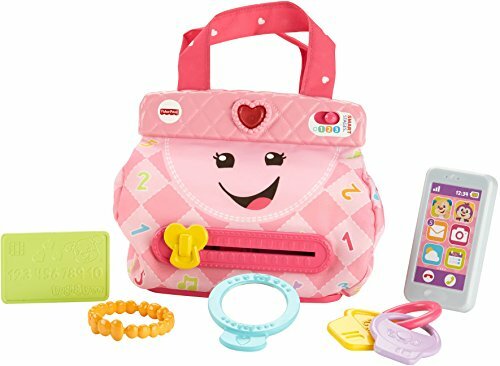 This Purse toy set has been made with a fantastic pink design, which kids find super exciting. It includes a pretend cellphone, lipstick, car keys, and a credit card. This provides your child with plenty to stay occupied with. The realistic design of these toys encourages young girls to use them in their pretend play scenarios to play with more creativity. We were impressed with how the cellphone has a flip-up feature that can also light up. Children can press the buttons on the cellphone and listen to how it makes sounds. These sound effects make for a more interactive playing experience. It’s also great for your child’s auditory learning senses. The realistic design of the accessories in this kit ensure that kids are able to use them to play creatively for hours on end. 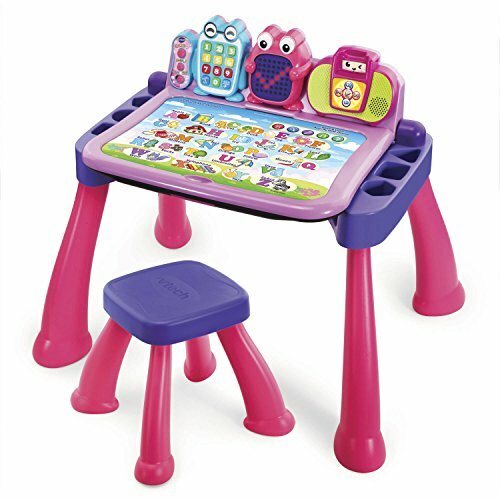 We liked how children feel encouraged to want to learn while using this pink activity desk. This is because it comes with a range of 5 activities that are engaging for your little one to educate themselves. There are displays that use LED lights to highlight various numbers and letters. As a result, children are able to improve their basic math and number skills. Not to mention, there are basic shapes available too. So, kids can develop their shape recognition abilities. A pretend telephone has also been included which toddlers love to play with. They can implement it into their pretend play scenarios, which is excellent for their creative thinking skills. 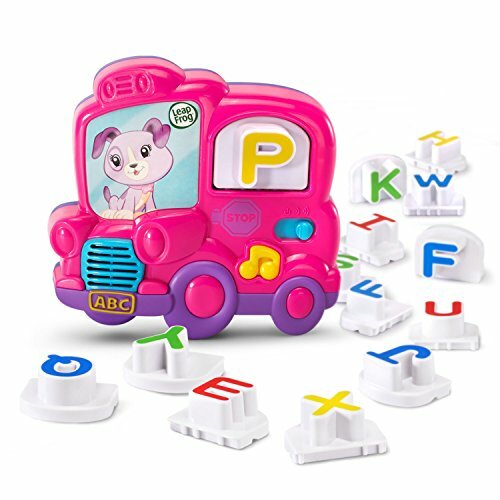 This is an awesome set that helps kids to learn more about the alphabet, numbers, and shapes, while also having a blast and being able to be creative. 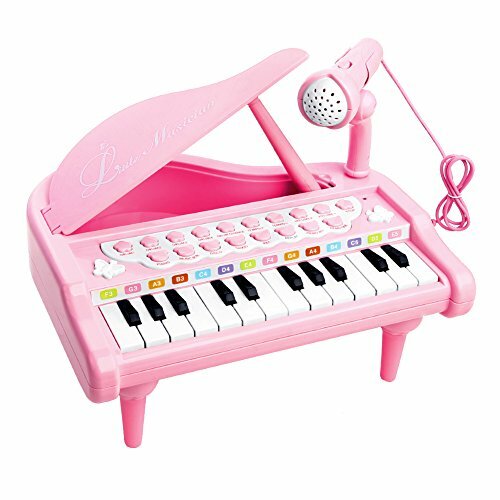 If your little one has an interest in music, you can be sure that they’ll have an absolute blast with this piano keyboard. It comes with a range of 24 keys, a control adjustment setting, and a microphone. This provides kids with plenty to experiment with which means that they can let their creative side flourish. Playing the keyboard is awesome for developing your child’s motor skills and hand-eye coordination. Moreover, listening to the music and even singing along is effective for improving their auditory learning senses. You can also easily adjust how high you want the lid of the piano to be by using the rod that’s provided for support. 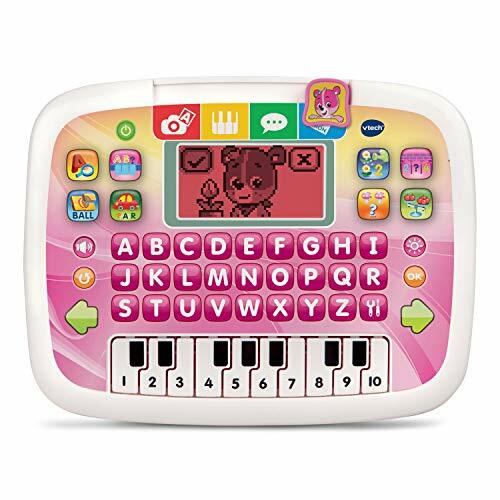 This is a fantastic keyboard that little girls have a blast using to make their own music and be creative with for hours on end. Fisher-Prices Purse set comes with a range of 5 accessories. These include a pretend mirror, cellphone, keys, bracelet, and credit card. This ensures that your child has plenty to play with for a long time. Toddlers have a blast implementing these items into their imaginative play games. As a result, you can expect your little one’s creative thinking skills to develop greatly. We were also impressed with how there are songs available. To be more specific, there are more than 50 songs, as well as phrases, and sound effects available. These are incredibly interactive and can help kids learn how to count and become familiar with various colors. More than 50 songs available! With over 50 songs available, and the ability to learn how to count and discover more about different colors, this set is highly educational and fun. The simplicity of this toy makes it great for a 6 month old all the way up to a 3 year old toddler meaning your baby can enjoy it for nearly a full 3 years. 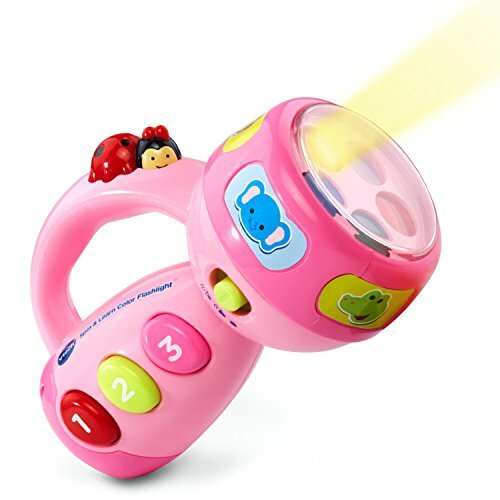 Girls have been having a lot of fun playing with this pink flashlight toy by VTech. We were impressed with how it comes with a range of more than 50 songs and sound effects. These are incredibly interactive. They also help children to improve their auditory learning senses. In addition to this, there are 5 different colors available that kids can shine using the torch. This is awesome for their color recognition abilities. In addition to this, there’s a learning center available which is great for teaching kids about numbers. So, it’s a flashlight toy that comes with a lot more surprises than your little one may be expecting. We liked how this toy helps children to improve their counting skills and color recognition while also having fun using the flashlight features. This tablet is available in a fantastic pink color which young girls have been loving. We liked how it comes with a total of 12 learning activities that all have different levels. Therefore, kids can learn about various topics and have the chance to progress and challenge themselves more. They’re able to improve their ability to count, while also developing their matching skills and knowledge on letters. In addition to this, there’s a piano feature available too. These allows kids to play the piano and make their own music. It’s a super creative process that also improves your little girl’s auditory learning senses. The progressive learning features available with this one enable toddlers to challenge themselves and learn more. 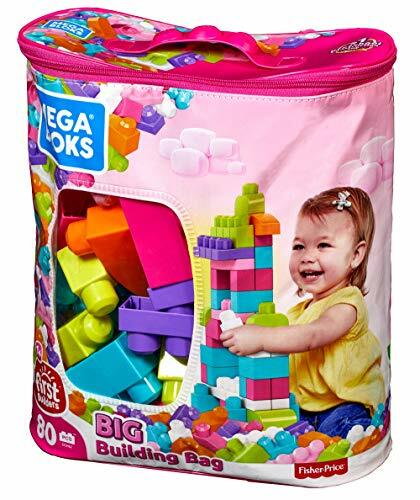 This building set comes in an awesome pink color which is what has been attracting girls to want to play with it. We were impressed with how it features a range of 80 pieces to keep your child entertained for hours. While they’re holding the various pieces and putting them together, you can expect their motor skills and hand-eye coordination to improve greatly. The size of the blocks have also been made for smaller hands. Toddlers also love having the opportunity to be super imaginative with the kinds of things that they build. Therefore, their creative thinking skills are provided with a great chance to flourish. With 80 pieces, toddlers can keep themselves engaged for hours while developing their motor skills and coordination. 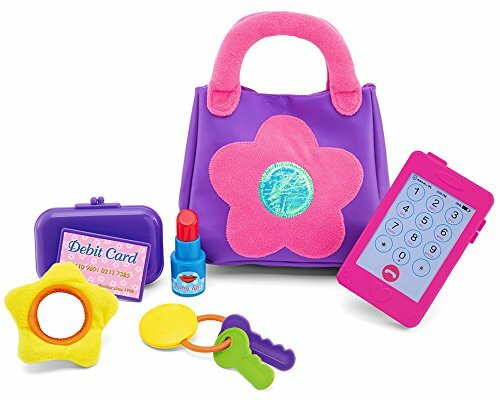 Toddlers are provided with a fantastic purple bag, along with pretend keys, a cellphone, lipstick, wallet, debit card, and a mirror. So, they have lots of items to stay occupied for hours on end. They have an absolute blast using all of these items in their pretend play games. This is because they have been made with a realistic design. Therefore, toddlers may role play what they may have seen their parents doings. As a result, their creative thinking processes are able to improve greatly. We also liked how all of the materials that have been used are of a high-quality and free from any toxins to ensure they’re safe for kids. Due to the realistic design with the items in this set, girls are able to use them to play with a ton of imagination for a long time. 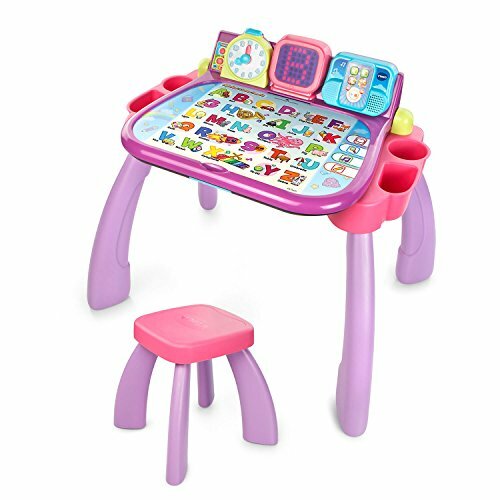 VTech’s Activity Desk is available in a pink color that baby girls have been loving. We liked how it features a wide range of cards that include music, animals, letters, and numbers. These are excellent for familiarizing your little one with a range of different topics. As a result, their basic math skills and alphabet knowledge are able to improve well. We also liked how there are over 30 learning activities in total. Not to mention, they’ve included more than 20 different melodies that allow kids to listen to music to make the learning experience more exciting. This is a great way to improve your toddler’s auditory learning senses. We liked how your daughter can use this activity desk to learn more about the alphabet and strengthen her counting skills, while also having fun and listening to the music. 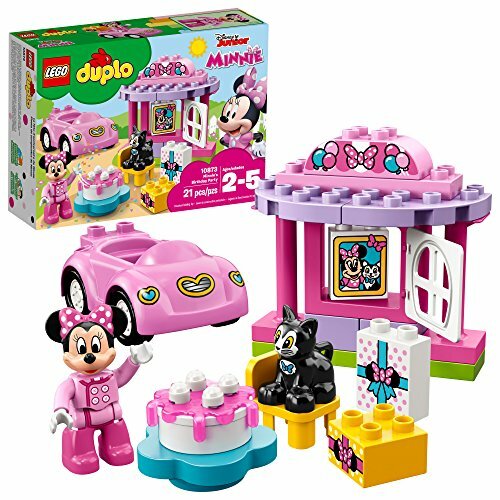 If you’re looking for a toy that your little girl can play with by using her hands, this Lego set would be a fantastic option. It comes with a range of 12 pieces that kids can use to put together by following the instructions. So, your little one’s motor skills and hand-eye coordination are able to develop well. Moreover, if they ever get a little stuck, their problem-solving abilities are provided with a great chance to improve too. Once they’ve finished building the set, they can use the Minnie Mouse Lego figure to play with it. They’re able to use their creative thinking skills to play and keep themselves entertained for hours. Girls have a blast following the instructions and building this set. It’s a fantastic way to develop their motor skills and coordination. 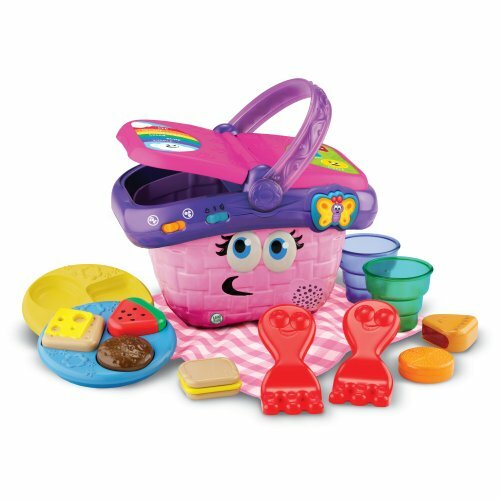 LeapFrog’s Picnic Basket set comes with a total of 14 pieces, as well as a basket, and blanket. There are a range of plates and cutlery, as well as a number of food items for kids to play with. If your daughter already has a play kitchen this set is a great addition. You can use these foot pieces to help kids learn about different colors and shapes. During the process, your child’s color and shape recognition skills are able to develop well. We also liked how there are songs available. Lifting the lid of the basket causes music and sound effects to play. This makes the learning experience incredibly exciting. Not to mention, it’s awesome for improving your child’s auditory learning senses. The picnic basket design and music features make this set incredibly immersive for kids, which means that they’re able to have fun while learning. 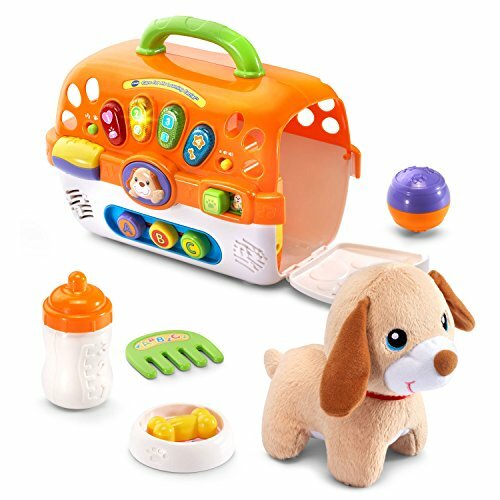 VTech’s Carrier Toy comes with a puppy toy that has been made out of soft plush materials. The design of this puppy is something that makes it super cute for girls to play with for years to come. We liked how you can activate various phrases by opening the door on the carrier. This is great for improving your little one’s auditory learning senses. In addition to this, there are buttons that light up. These are awesome for improving your child’s knowledge on different shapes and colors. Furthermore, kids love pretending that the dog toy is real and they have a blast looking after it. This is great for their creative thinking skills and teaches them about responsibility. Toddlers are able to use this set to play creatively while learning what it’s like to look after a pet, which is great for teaching them about responsibility. Are you looking for a gift that your toddler can use to play more actively with? If so, this ride on toy by Fisher-Price would be a great option. It has been made with a pink and purple Barbie design that little girls have been loving. We liked how they’ve made the foot pedals larger to make it easier for children to use. This is one of the main features that makes it such a great choice for toddlers who have never rode any kind of bike before. 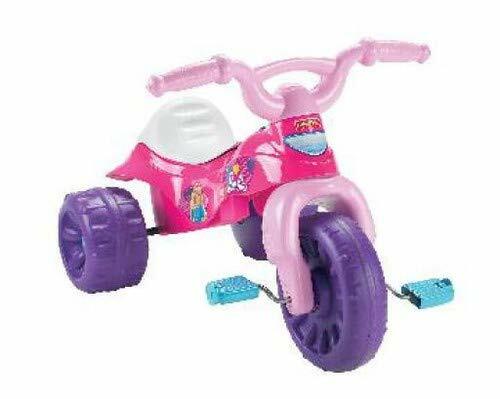 Riding this trike is an excellent way for your child to develop their coordination and balance. It’s also fantastic for getting them outside more often and exercising. Not to mention, storage space is available under the seat too! We liked how this trike encourages kids to play outdoors more often and exercise while having a blast. Girls have been loving how they can use this set to pretend to do their own makeup, as well as do it on others. It’s an awesome set that encourages toddlers to play with others and improve their social skills. 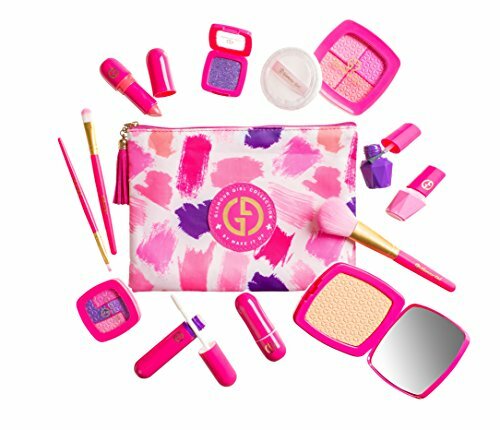 It comes with a range of 13 pretend makeup accessories. These include eye shadow, bronzer, lip gloss, foundation, and more. So, kids are provided with plenty of items to stay occupied for hours. We liked how children can easily implement these pretend items into their imaginative play games. They’re able to use them to play with a lot of creativity. Moreover, the realistic design makes the experience more immersive for toddlers. The realistic design of these pretend makeup items encourages kids to use them in more creative ways while playing. 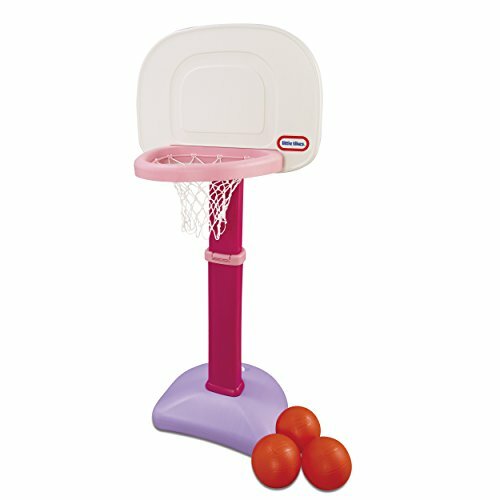 This Little Tikes Basketball Set is a great little gift that encourages kids to want to play more actively. Girls have been loving how it has been made with bright pink colors as it looks more exciting. There are 3 small basketballs included which have been made to be the perfect size for your little one’s hands. While they’re aiming and throwing the balls into the net, their motor skills and hand-eye coordination are able to develop well. We also liked how it can be a fun group game for kids. As a result, your child’s social skills could improve greatly. In addition to this, the height of the hoop can be adjusted to suit your child as they grow up. This is an excellent set that makes it easier for toddlers to play in small groups and improve their social skills – while also developing their motor skills and coordination. Leapfrog’s Tea Set comes with a fantastic light up feature that involves a range of different colors. As a result, your little one’s color recognition skills are able to improve well. There are also songs available too. These songs make the tea party experience a lot more exciting. This feature is also excellent for stimulating your child’s auditory learning senses. There are pieces of pretend cake available as well. Therefore, kids are provided with plenty of stimulus to use their imaginative thinking side to play with a ton of creativity. The set is also super fun to play with others in small groups, which is great for your child’s social skills. 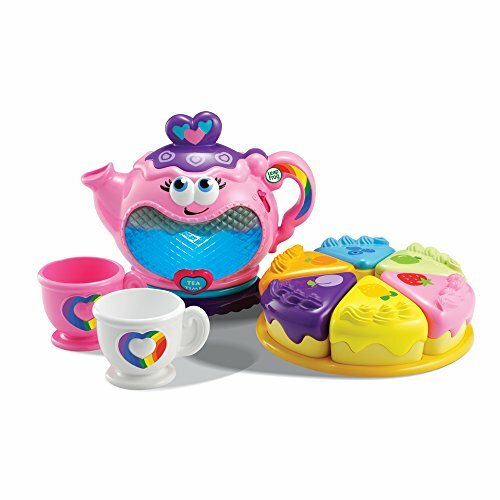 Toddlers have a blast using this tea party set to play with others and use their creative thinking skills to be entertained for hours on end. LeapFrog’s Letter Set comes with a range of 26 magnetic pieces that provides kids with a more interactive learning experience. They’re able to learn more about the alphabet due to how the magnet toys have been designed with bright colors. This is also excellent for improving your little one’s color recognition skills. Not to mention, it involves a hands-on approach. As a result, you can expect your child’s motor skills and hand-eye coordination to improve. We liked how they’ve made the magnetic blocks just the right size for smaller hands to hold onto. This makes it a lot easier for your little girl to use. There are even songs available that make for a super fun time. We liked how there are songs available as it makes the process of learning about the alphabet more exciting for toddlers. Toddlers have been having a ton of fun playing in this playhouse along with other kids. It’s an awesome gift that enables kids to play together, which improves their social skills and ability to work in teams. We also liked how children love getting together inside the tent to come up with imaginative pretend play scenarios. It can be an incredibly fun way for them to develop their creative thinking skills. It can be used both indoors and outdoors and parents have been liking how setting it up and taking it down it super simple. There’s a mesh design too which allows plenty of airflow inside to remain safe for kids. 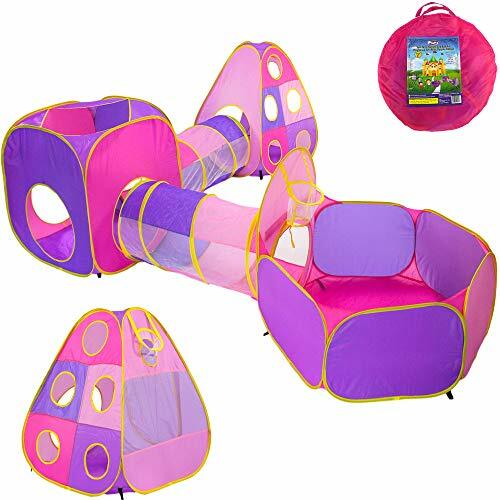 The bright pink design of this one encourages girls to want to play inside together to get creative and improve their social skills in the process. During your search for toddler toys for girls, you will have come across a wide range of different options. It can be difficult knowing what specific things to look for when buying toys for toddler girls. Furthermore, narrowing down the search to the ones you think are best can be tricky too. That’s why we’ve put together this buyers guide section. You can use the information below to learn more about toddler toys and how to go about selecting one for your little girl. After reading through our review above, you will have noticed that there are a number of different toys for girls available. If you wanted to gain a better understanding of the popular kinds of toys and be able to easily distinguish between them, take a look below. There are numerous choices in our review that have more of a focus on education than others. For toddlers, the educational aspects tend to focus on the alphabet, numbers, shapes, and colors. These toys are incredibly effective at helping your child to learn about these topics, while having a ton of fun at the same time. Toddlers have an absolute blast playing with ride on toys. They are super fun for kids as they enable them to scoot around or be pushed which provides them with a unique playing experience. In addition to this, toddlers are provided with a fantastic opportunity to improve their coordination and balance. We have included some toys in this review that encourage children to get outdoors more often. This is because playing outdoors is a different experience to being indoors and it has benefits for kids. They have more open space to run around in, which is great for increasing how much they exercise. Musical toys including pianos and guitars are remarkably popular among toddler girls. This is because these toys allow them to use their creative thinking skills and really put them to the test by coming up with their own music. Not to mention, playing various musical instruments is an exciting way to develop your child’s motor skills and hand-eye coordination. Listening to the music is also awesome for their auditory learning senses. If you’ve been struggling to find ways to keep your little girl entertained during bath time, you’ll definitely want to consider bath toys. These are awesome for keeping children entertained so that bath times are no longer a hassle. These bath toys also involve a hands-on approach to playing, which develops your child’s hand-eye coordination and motor skills. Toddlers are at the stage in their lives where they’re really starting to get in tune with using their hands and legs. Therefore, climbing toys can be a fantastic way to encourage them to want to continue developing these skills. Toy cars that have been made with pink and purple designs can be a lot of fun for toddlers. They love pushing them around and being able to use their creative thinking processes to play independently for hours. Dollhouses have been a timeless classic among little girls for years and today is no different. Your daughter will no doubt love to use her imagination in playing with one of these in tandem with her toy dolls. They also encourage group play with her friends. If you’re having a hard time trying to pick out a toy based on your toddler’s specific age, the section below is for you. For 1 year old girls, we recommend going with toys that have a lot of interactive features. This is because these toys provide them with a lot of visual and audible stimulus, which is great for their development. However, it’s also effective for keeping them entertained for longer. A simple set of building blocks could also be a great idea as they’re at the age where they’re starting to develop their motor skills and hand-eye coordination. When it comes to 2 year old toddler girls, finding toys that enable them to use their imagination while playing is a great choice. 2 year old girls are able to start using their creative thinking skills to come up with more interesting ways of playing. Therefore, toys that allow them to expand on their creative thoughts are more effective at keeping them engaged. As far as 3 year old girls are concerned, you can start looking at the options that have a heavier focus on education. At this age, your child is more equipped to start to really learn more about numbers and letters. You can start to nudge them in the right direction to start improving their basic math skills and knowledge about the alphabet. So, that wraps up our review on what the best gifts for toddler girls have to offer. Make sure that you consider all of the main features, pros, cons, age recommendations, and the points that make each one stand out. Our buyers guide section can also be very handy in helping you to make a final decision. We hope that all of the information in our review has provided you with everything you need to ahead and pick out the best toy for your special girl.